In celebration of our very own Buster McLaury being chosen as the 2014 Horseman’s Reunion most admired Horseman, I want to share with you a podcast of a story he shared with a group on a rainy day. The funny thing is, half of the group wasn’t even listening. Why listen? It wasn’t pertaining to them right? They don’t have that problem so it wasn’t important. One of my very closest friends used to tell me, “If my Dad tells you the same story multiple times, don’t tell him, ‘I know, you’ve told me that before’. Be quiet and listen. There is a reason he is telling you the same story again”. You might think this story doesn’t pertain to you, but it does. Thank you Lauren. I really enjoyed listened to the podcast. We can learn so much from just observing a horse’s body language if we stop a while and pay attention. Hi Lauren. I really enjoyed the podcast. Your voice is so soothing! I’d never listened to a podcast, it’s always been video, but I’ll tell you, it was easier to really hear him and his message without looking at the horse or the other people in the video, etc. What you both said really makes sense. 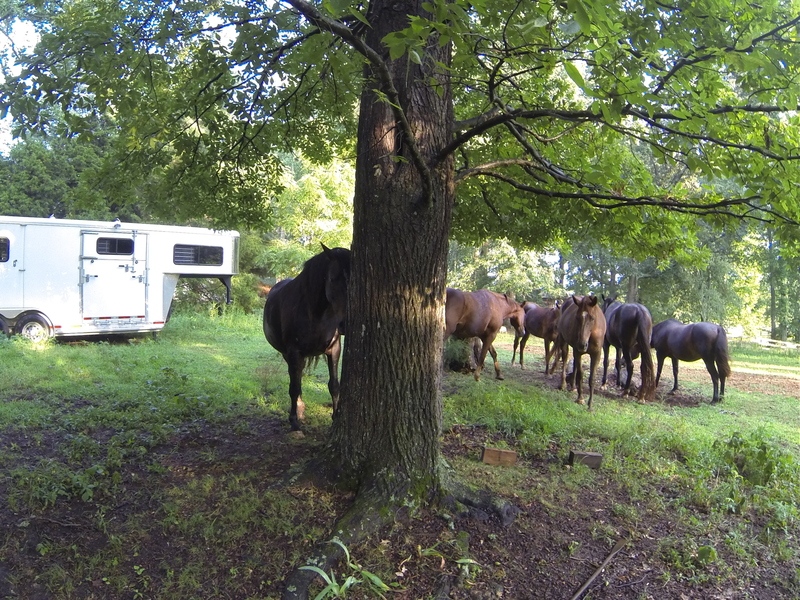 My concerns: I am the first positive experience in my horses’ lives concerning a horse trailer, so the confidence they have is from me allowing them to gain it. I have a stock trailer and I don’t tie them in there, as I’ve thought about it, as well as have been told that by tying them inside that “barricade on wheels,” they are made doubly claustrophobic and are unable to move their feet if they need to. So, if I have two horses, I shut the center divider and leave them loose, and with one horse, I like him up in the front half of the trailer, so I shut that center door with him up front. I have worked with my horses on loading and unloading with confidence to the point where they’d much rather stay in the trailer than have to unload and reload again (I send them in); they are more comfortable just standing in the trailer. I leave the door open, they get in, turn around and stand at the opening and look out. I can leave them standing there and go do something else and they won’t get out till I ask. They know if they do, they just have to get back in; no harsh consequences, just the act of having to step back in, and they’d rather just relax in there. However, they are uncomfortable when I shut the door and they want back out if they are the only horse in the trailer. They all do fine with another horse, but I really need to start only taking one horse when I go ride. Up until now (this clinic), I’ve met someone and brought a horse for them, or I’d bring along another horse for the one I was going to ride, so he wouldn’t be as nervous, but that can be pretty impractical, as then I have to accommodate that horse somehow while I go ride, etc. My issue is that I am not sure how to go about shutting the door and them not feeling trapped (evidenced by a worried look, trying to push the door open, putting their head over the divider, and/or pacing or weaving). I want them to be in there alone with the door shut because they want to be and are confident about it. Do I allow them to sort through their emotions as they are in there, or do I just continue to open up the door and let them back out over and over again when they want out? I did that with Histoiree and he regressed – it was almost as if he knew if he were worried/acted worried, the result would be that I’d open the door and he’d get to come out, like A = B; his attempts to get me to open the door almost got worse each time – we’d done it about 25 times. I don’t know if that is what he was doing for sure, but it started to seem that way, and that’s what some bystanders told me (he’s got my number/he’s “playing” me). Of course, once I let him out, I’d send him right back in and repeat, but we really weren’t advancing. Eventually, I just fed him in there (twice a day), shut the door, and I had to walk away and he’d calm himself; each time he did better and would stand calmly for longer and eat. If he turned around and didn’t eat, just wanted out at first, I’d have him back up, as he’d be facing out, and I’d shut the divider. Listening to Buster, I’m not sure if Histoiree really wants to be in there or if he’s just doing what I ask, and because once he’s in there and that door is shut, he really doesn’t have a choice. I don’t want that if that’s the case. He doesn’t unload in a hurry though and he’s thinking; he’s happy to be out, but I don’t get run over. My other horse, Zuma, has been having more trouble than Histoiree staying in alone, and he has issues backing out as well; he’ll walk out forward calmly, but panics if I ask him to back out; although he will back out his front feet, not his hind feet. We’ve spent lots of time working on backing over poles, through small spaces, down a curb… He is much more confident about getting in – it’s almost like a piece of playground equipment for him, and if I have the trailer out and open in the pasture with our herd of five, he’ll get in there and not allow other horses in! I’d love to hear your thoughts on this if you have time. I want my horses to think and have it be their idea to be in there, have the door shut, and travel alone confidently – not panicked or frozen. I don’t want to sacrifice their emotional and physical well-being, so I can go ride and have a good time, but we need to overcome this. I want my horses to enjoy being with me and going places, not feel obligated. I don’t believe they fear me or what I’ll do if they don’t stay in (I’m calm and confident about the trailer with them – not forceful), but they’d rather not be trapped in there alone. I have a hard time knowing how to achieve this and how to get to the next stage of their growth in confidence in this area. I really want to do what’s right for them. Hi Holly! One of the best things I ever learned about getting a horse in the trailer and feeling comfortable was from Bill Dorrance’s book, “True Horsemanship through Feel”. In his book he says, “The horse has to learn how to get out of the trailer at the same time he learns how to get in”. Basically, ask your horse after each step he takes to get in to then back out. Ideally do this BEFORE they get the idea to back out. He outlines this beautifully with pictures. Check it out!